What is the Charter for Justice? The charter was launched in 2018 as a way of highlighting to the public the crisis in the criminal justice system, and offering proposals to address that crisis by adopting some key principles that everyone should be able to unite behind and we can campaign for. The 2018 book by the “Secret Barrister” which identifies some of the numerous and cumulative failings in the current system, is called “THE LAW IS BROKEN”. And it is. The author laid bare the results of the drive to prosecute and defend on the cheap, and warns that “we are moving from a criminal justice system to simply a criminal system”. But the secret barrister’s rage is equalled only by astonishment at the “wall of silence” and “collective indifference” of the public to the parlous state of affairs. We know that the broken justice system can be fixed, but we also know that to fix it involves hard expenditure of cash. And yet MoJ projections currently show further proposed cuts to the budget, claiming that it needs to reduce spending by around £500m per year from 2015-16 levels by 2019-20. If it is hard to get the public interested in the problem, it will be impossible to get support for the solution. The prison crisis is ongoing and remains a newsworthy story. David Lammy’s report came out last year, and highlighted that issues of racism and discrimination have not gone away. Then we have had ongoing disclosure stories. Nothing new to us, but suddenly the right case hit the headlines leading to media attention and a flurry of similar scandalous stories. And even the action by the bar gained media attention. The charter aims to join all this up, by helping people outside the system see that this is all part of the same problem- chronic underfunding of the justice system. 1 complaining about legal aid cuts in terms of our pay rather than broader consequences. 2 reactive or isolated campaigns on isolated issues, rather than focusing on the bigger picture. Arguing for reasonable remuneration needs to focus on the consequences of poorly paid lawyers: – inadequate investigation by the police, inadequate review by CPS, cutting corners by prosecution and defence, factory-firms, increasingly inadequate advice and/or representation, a recruitment crisis in an already greying profession, and ultimately miscarriages of justice. So the Charter sets out 5 principles that are easy to understand and support, and if adopted and properly funded would restore faith in the justice system and fix what is now broken. The Charter is something that we hope legal affairs or justice commentators show interest in, that the public would support, that campaigners can argue for, and that parties and politicians can sign up to. It offers unity in that all lawyers can support the aims, whereas previously there have been differing interests and factional differences (bar vs solicitors, big firms group vs small, etc) We need a united approach -no back- door meetings with the MoJ by the bar or solicitors alone. It is backed by initial sponsor signatories including the LCCSA, CBA, Howard League, Transform Justice, CLSA, Jengba and the Law Friends Society. Jerry Hayes spoke on the DISCLOSURE crisis. Attention then focussed on the (then current) advocates dispute over AGFS reform, and the contentious ballot, from which solicitor advocates were excluded, voting against action by a narrow margin in favour of a deal. Impetus for the charter ebbed away. Request a meeting with the Lord Chancellor and MoJ to present the Charter. Use Charter for campaigning on Justice issues at next election. Please contact LCCSA President Jon Black jonathanb@bsbsolicitors.co.uk if you would like to help with campaigning, or be a signatory. For too many years those who are close to the criminal justice system have observed the impact of funding restraints and cuts which have led to dilapidated buildings, reduced access to Justice, and a prison service on the point of collapse. The Lammy report has highlighted inequality of outcomes, and recently highlighted disclosure problems have shown systemic failures in the system. 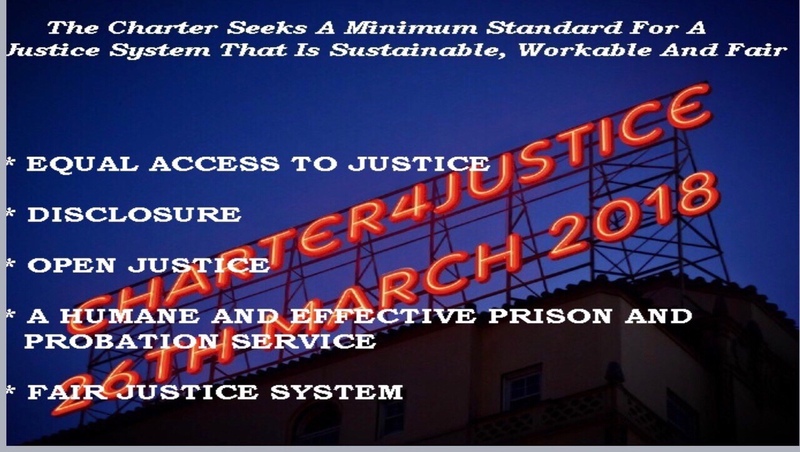 This charter seeks to set the standards for a justice system that is sustainable, workable and fair. Publicly funded representation is essential for defence and prosecution. The CPS needs to be properly funded to properly present cases, and legal aid sufficiently available and remunerated to ensure equality of arms in an adversarial justice system, and to allow everyone access to legal advice and representation irrespective of means. There should be full and fair disclosure of the Prosecution case to a suspect at the police station and defendant at court. Criminal justice is not a game, and proper disclosure needs to be made in a timely fashion so that those accused by the state can fully understand what they are accused of, and respond accordingly. Failures in the disclosure process waste huge resources throughout the system and result in wrongful convictions, avoidable appeals and abandoned trials, damaging both the accused and victims of crime and undermining public confidence. There is an urgent need to increase fairness, effectiveness and accountability within the disclosure process. There should be no further court closures, and court buildings and their fabric should be maintained to an acceptable standard. The latest initiative of online pleas is a dangerous development that will remove the direct engagement that a defendant has with the court and legal representatives. Every defendant or witness or member of the public should have a right to attend a court hearing in person. The recent change to the Police and Criminal Evidence Act allowing the police to video-interview people wherever they choose without legal advice undermines vital protections for those suspected of crime and should be prohibited. This is especially dangerous for the young, those with mental health issues or learning disabilities, or for whom English is not a first language. Urgent action is required to upgrade and maintain the quality of prison buildings and facilities. There are too many people in prison and at risk of being sent to prison for failing to comply with conditions and urgent action is required to reduce the number of people in prison. We must learn from other countries where prisons are more forward thinking and humane and reoffending rates are lower. There must be recruitment and retention of sufficient prison officers, and access to properly funded rehabilitation and education courses within the prison system. The part privatisation of the probation service is a costly failure which should be reversed. Urgent action is needed to achieve equality of justice and eradicate the discrimination identified in the Lammy Report. Unless all have faith in the processes as well as the outcomes of our justice system, trust in the system will ebb away. We need to work to eliminate unconscious bias amongst all those involved in the system through diverse recruitment, better training and rigorous monitoring. Justice cannot be seen to be done when there are the clear differences in treatment and outcome identified in the Lammy Report, or arising through use of the legal concept of Joint Enterprise. This entry was posted in Featured on May 21, 2018 by Greg Foxsmith.